Arctic Challenge qualifying events were staged earlier this week with the semi-finals due to be staged later today (Friday 18 February) and the main event, the finals, on Saturday. Stars of the show include snowboard legend Terje Haakonsen and X-games winner, triple-cork Torstein Horgmo. The Oakley Arctic Challenge aims to be a laboratory for snowboarding. "We change and experiment with formats, judging, competition set up, TV-production - all aspects of the sport and the presentation of it. Three years ago we introduced the variation score for quarterpipe; awarding trick variation and sourcing this information directly to riders, spectators and TV viewers through TV graphics. The system was fair, open and exciting. The riders knew what to expect from the judges and the feedback on their performance was immediate - live, on the air, on the mike, through the wire." Said a statement from the organisers. 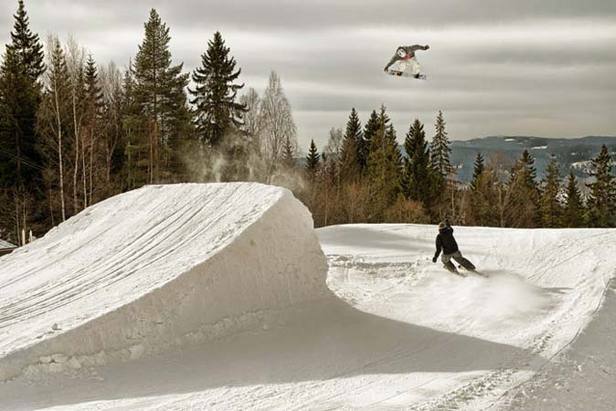 The Oakley Arctic Challenge 2011 is being staged at Oslo Vinterpark, Tryvann - on the Wyllerløypa-side. Since there are no parking available on the Wyllerløypa-side of Oslo Vinterpark, the best way to get there is either by parking in Tryvann and ride down to Wyllerløypa, or by taking tram 2 to Røa, and bus 41 to Zinober. The Oakley Arctic Challenge has made some big improvements in its environmental credentials, cutting transportation by 16% and making sure more waste is being recycled. This year there is an extra focus on emissions at The Oakley Arctic Challenge 2011 by giving a Climate Promise or "Klimaløfte". That means we map all aspects of the competition to find out how we can cut emissions in transportation and power consumption. To cooperate with the only Norwegian producer of cars- the electrical car Buddy is being used to help cut emissions around Oslo. The event is Eco-lighthouse certified. This Norwegian standard is a certificate that means the Oakley Arctic Challenge takes extra environmental considerations in their production. That involves green considerations in how and what they buy, the means of transportation they use, and how they make sure as much waste as possible is recycled.